دنیا بحران میں ہے، بڑے پیمانے پر جنگ و جدل، دہشت گردی، قتل و غارت ، نسل کشی، نسلی تشدد جاری ہے تاکہ مسلمانوں کے علاقوں پراوران کے قدرتی وسائل پر کنٹرول حاصل کیا جا سکے. نوآبادیاتی طاقتوں کی طرف سے بے گناہ مسلمانوں کے استحصال کے لئے مسلم ممالک پر قبضے اور کنٹرول کے لیےان ممالک کو جمہوریت اور آزادی کے دلفریب نعروں کی آڑمیں عدم استحکام سے دوچارکر دیا گیا ہے. جبری اخراج اورنقل مکانی جاری ہے. اقتدار کے بھوکے بدعنوان مسلمان جابر حکمرانوں، لالچی طاقتور ہم وطنوں اور انتہا پسند مذہبی گروپوں کا ظلم و جبر بے مثال سطح تک پہنچ گیا . لوگ پریشان ہیں، وہ اس دلدل سے باہر نکلنا چاہتے ہیں لیکن کوئی راستہ نظر نہیں آتا. عوام کی “امن اور انصاف” کی خواہش کوغیر ملکی مدد اور مالی تعاون پر پلنے والے مذہبی انتہاپسند طرف سےمذہب کے نام پر استحصال اورنام نہاد جہادیوں کو بھرتی کرنے اور لوٹ مارکے لیےاستمال کیا جا رہا ہے .یہ آگ پر پٹرول ڈالنے کے مترادف ہے اس طرح انسانیت کے دشمنوں کومسلمانوں پر مزید ظلم اور قتل و غارت کا جواز فراہم کیا جاتا ہے. وہ مسلمان ممالک جو سیاسی، فوجی اور مالی طور پر مستحکم ہیں ان کو منظم طریقے سے مذہبی فرقہ واریت، نسلی، لسانی اورقبائلی خانہ جنگی کی طرف گھسیٹ کر ان کے ٹکڑے ٹکڑے کرنے کی کوششیں کی جا رہی ہیں.مسلمان حکمرانوں اور قیادت کی پر اسرار خاموشی معنی خیز ہے وہ صرف اپنے اقتدار کی حفاظت کے لئے، دشمن طاقتوں کے ایجنڈےپر کام کرنے کو ترجیح دیتے ہیں.ان کی اصل اندرونی کمزوریاں اورکرپشن کی دولت سامراجی طاقتوں کے پاس ہے. تعداد میں ڈیڑھ ارب سے زیادہ مسلمان جواپنی تہذیب، ثقافت، تاریخ اور وسائل سے مالا مال ہیں، افراتفری کی حالت میں رکھ کرعالمی امن ممکن نہیں. کوئی بھی محفوظ نہیں رہ سکتا.لہٰذا ضرورت ہے کہ دانشور، مفکرین اورجو لوگ اس صورت حال پر پریشانی محسوس کرتے ہیں آگے آہیں اور موجودہ اور مستقبل میں چیلنجوں کا سامنا کرنے کے لئے “پائیدار امن کے لئے طریقہ کار” کے لیے مختصر اور طویل مدت کے منصوبے بنایں. جن پر عمل درآمد سے اس دنیا کوبنی نوع انسانی کے لیے پرامن بنایا جا سکتا ہے. The quest for “Peace and Justice” is exploited by imperialist sponsored extremist in the name of religion to recruit Jihadists for power, plunder and exploitation. It adds fuel to fire and provide lame excuse, justification for more oppression and killing of Muslims by the enemies of humanity. Most of Muslim rulers & leadership have been entangled to tacitly serve agenda of imperialist powers, just to protect their rule. The Muslim countries which were relatively strong and wealthy have been systematically dragged into sectarian, ethnic & tribal civil war and breakup, thus adding fuel to fire. 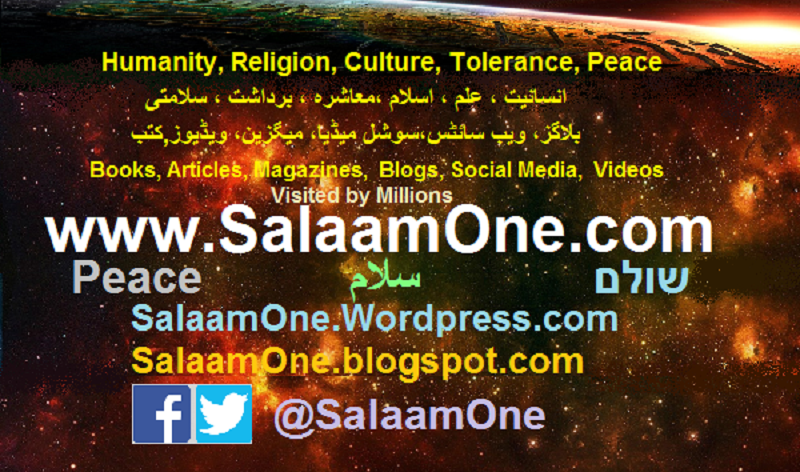 www.SalaamOne.com: This site is focused on humanity in general and the followers of three Abrahamic religions. Over 250 ‘Posts’ provide additional information on contemporary issues. Over 200 pages provide sufficient information on the variety of subjects of interest grouped in 60 categories and 200 tags. These pages are also visible as hierarchy in secondary sidebar/ bottom. Peace-Forum: Peace is a state of harmony characterized by the lack of violence, conflict behaviors and the freedom from fear of violence. Commonly understood as the absence of hostility, peace also suggests the existence of healthy or newly healed interpersonal or international relationships, prosperity in matters of social or economic welfare, the establishment of equality, and a working political order that serves the true interests of all. Tagline: USA. Conflicts, Muslim World, Power Politics, Pakistan, War of Terror, Extremism, Understanding Islam, Europe, Zionism, Interfaith, Christianity, Bible, Qur’an, Islam, Islamophobia, Crusades, Middle East, الشرق الأوسط, History, Religion and Reason, Democracy, Israel, Human Rights, America, India, Globalization, Palestine, Jews, Revival. Pakistan Posts پاکستان نامه: Our ancestors expelled foreign colonial rulers in 1947 after great struggle and sacrifices so that people could freely live in peace in line with Islamic values of freedom, equality and justice, but oppressors are back through their proxies. We are perplexed the way dragged in to war of others.We must break all the shackles of slavery, regain independence and dignity! We have enormous potentials, choose competent and honest leadership. Freedom is Priceless. Here eight pages and over 500 ‘Posts’ provide adequate resource on Pakistan affairs and contemporary issues. شروع اللہ کے نام سے، ہم اللہ کی حمد کرتے ہیں اس کی مدد چاہتے ہیں اوراللہ سے مغفرت کی درخواست کر تے ہیں- جس کواللہ ھدایت دے اس کو کوئی گمراہ نہیں کرسکتا اورجس کو وہ (ہٹ دھرمی کی وجہ سے ) گمراہی پر چھوڑ دے اس کو کوئی ھدایت نہیں دے سکتا- اللہ کو علم ہے کہ کون ہدایت پر ہے اور کون گمراہ- ہم شہادت دیتے ہیں کہ اللہ کے سوا کوئی عبادت کے لائق نہیں، محمد ﷺ اس کے بندے اورخاتم النبین ہیں اور انﷺ کے بعد کوئی نبی یا رسول نہیں ہے. درود و سلام ہوحضرت محمّد ﷺ پر اہل بیت (رضی اللہ عنہ) اور اصحاب اجمعین (رضی اللہ عنہ) پر. In the name of Allah, We praise Him, seek His help and ask for His forgiveness. Whoever Allah guides none can misguide, and whoever He allows (stubborn and arrogants) to fall astray, none can guide them aright. Only He knows who is truly guided or misguided. We bear witness that there is no one worthy of worship but Allah Alone, and we bear witness that Muhammadﷺ is His slave-servant and the seal of His Messengers. There is no nabi or rasool after him ﷺ. Peace be upon Prophet Muhammad ﷺ, his household (رضی اللہ عنہ) and his companions (رضی اللہ عنہ). The ‘Five Pillars of Faith’ are the physical manifestation of combination of faith and practices, which are also the forms of worship (Qur’an;2:21, 43:64, 69:52); the first two; Shahada & Salah (prayer 5 times a day) are daily, next two Zakat (Charity, Alms) ) & Saum (fasting, during month of Ramadan) are annual and the last, Hajj (Pilgrimage to Makkah) is once in life if one can afford. To affirm his/her belief in Allah (Single God). To believe in His messengers (from Adam, Noah, Abraham to Moses and Jesus,25mentioned by name in Qur’an), and Muhammad (peace be upon him) to be His Last Messenger for humanity. His books, Qur’an and all scriptures revealed to His Messengers which also include the original Torah, Psalms (Zabur) and original Gospel (Injeel) to Jesus Christ (pbuh). To believe in Al Ghaib [metaphysical creatures] like the angels, Jinns, etc. Resurrection after death on the Day of Judgment, accounting and the scales, hell and paradise. The good and evil of destiny are in the power of Allah, the Most High. Jihad- Important Element of Faith (Ayman): Strenuous Efforts (Jihad) made sincerely for advancement of the cause of Allah, though not included among five pillars of Islam; but it is an important element of the Faith (ayman, Belief).(Qur’an;49:15). The aim of making Strenuous Efforts (Jihad) is three fold: The first and foremost is to; ‘Strive Against Selfish Desires’ (Nafs ammarah), to purify the heart, so that the faith (ayman) of Islam is deeply rooted in the heart, to become fully subservient to the commands of God and His Apostle Secondly, making strenuous efforts (Jihad) to convey the Last message of God (Islam) to the humanity(Dawah) called Bigger Jihad (Jihad Kabira)(Qur’an;25:52). Thirdly Jihad (warfare) is to be conducted by Islamic State to provide protection to Muslims and non Muslims against oppression. The specific word used exclusively for warfare is Qitaal(Qur’an;2:216-217) or Qatelu, wa-Qatalu (Qar’an;4 89-91). The warfare is to be conducted with in laid down Islamic principles. Killing of innocent people and creating mischief on earth (fisad fil ardh) for power and glory is not Jihad. The Prophet (pbuh) & Household: Muslims extremely love the Prophet and his household, Allah says: “The Prophet is closer to the Believers than their own selves and his wives are their mothers (Umuhatul Momineen)”(Qur’an;33:6). Hence they can not tolerate any blasphemy against them. The House Hold of the Prophet (pbuh), in addition to his wives also includes his daughter Fatima, her husband Ali Bin Abu Talib, their children Hassan and Husain. All the members of Household of Prophet(Ahl-ul-bait), were virtuous human being, they greatly contributed towards the cause of Islam. Prophet loved them all. Imam Hussein laid down his life for the just cause of Islam. From the Latin pax, meaning “freedom from civil disorder,” the English word came into use in various personal greetings from c.1300 as a translation of the Hebrew shalom. Such a translation is, however, imprecise, as shalom, which is also cognate with the Arabic “salaam”, has multiple other meanings in addition to peace, including justice, good health, safety, well-being, prosperity, equity, security, good fortune, and friendliness. At a personal level, peaceful behaviors are kind, considerate, respectful, just, and tolerant of others’ beliefs and behaviors — tending to manifest goodwill. Peace سلام is a basic concept in Islamic thought. The good life according to Islam is in submitting to God and in worshiping Him as The Creator and The Master and to recognize the innate nature of man. The individual who will recognize his true nature on which every person is created will be able to live together in society with peace and affection to each other. ‘This history of man is an infinite process of mutual conflicts, sanguine battles and civil wars. In these circumstances can we have among mankind a constitution, the social life of which is based upon peace and security? The Quran’s answer is: yes, provided man takes for his ideal the propagation of the Unity of God in the thoughts and actions of mankind. The search for such an ideal and its maintenance is no miracle of political manoeuvring: it is a peculiar greatness of the Holy Prophetﷺ that the self-invented distinctions and superiority complexes of the nations of the world are destroyed and there comes into being a community which can be styled ummatan muslimata ’l-lak (a community submissive to Thee, 2: 128) and to whose thoughts and actions the divine dictate shuhadā’a ‘alā al-nās (a community that bears witness to the truth before all mankind,Quran;2:143) justly applies’ (Speeches, Writings and Statements of Iqbal,pp.262-63). [IQBAL’s famous ‘Statement on Islam and Nationalism in Reply to a Statement of Maulana Husain Ahmed. Humanity needs three things today – a spiritual interpretation of the universe, spiritual emancipation of the individual, and basic principles of a universal import directing the evolution of human society on a spiritual basis. Modern Europe has, no doubt, built idealistic systems on these lines, but experience shows that truth revealed through pure reason is incapable of bringing that fire of living conviction which personal revelation alone can bring. This is the reason why pure thought has so little influenced men, while religion has always elevated individuals, and transformed whole societies….. The idealism of Europe never became a living factor in her life, and the result is a perverted ego seeking itself through mutually intolerant democracies whose sole function is to exploit the poor in the interest of the rich. Believe me, Europe today is the greatest hindrance in the way of man’s ethical advancement.. …..